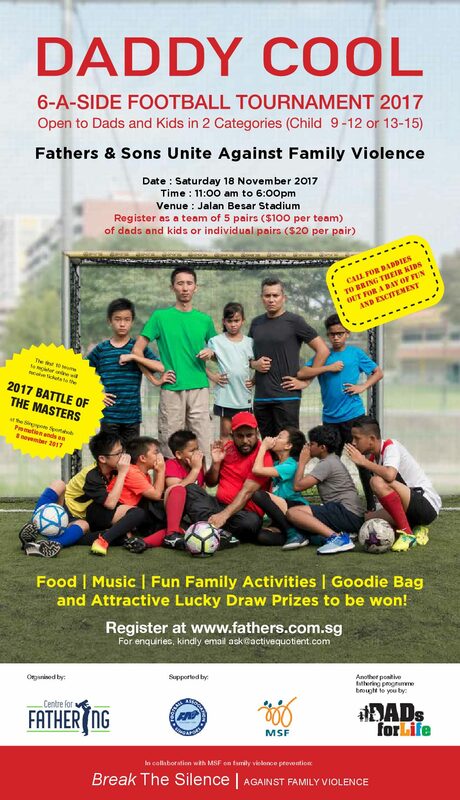 Join in this year’s Daddy Cool 6-a-side Football 2017! Enjoy food, music and fun family activities! Kick off the November holidays with the kids in this football fun packed day! What time will the event start? How long will the event last? Registration will start at 10:00am, close at 10:45am, kick off will be at 11:00am. Latecomers will not be entertained. The event should finish about by 6:00pm. Your place will be confirmed via email/sms on receipt of the Registration Fee of $100 for a complete team (payment via Interbank Transfer only). Only first 10 complete team registration qualifies for the masters tickets, ends 8 November. Please download and complete the Registration Form with the transfer of payment and upload a screen capture of your transaction record/slip in the Form so we can trace the payment. Kindly call 67691238 or email kalaiselvan@fathers.com.sg for any queries relating to payment and confirmation. Teams will then be re-grouped for the second round-robin matches, with the top 2 will go on into knockout stage of the cup and plate competition respectively. Should a game end in a draw in the knockout stage, teams will take part in sudden death penalty kick to decide the winner. During sudden death penalty kicks. only the children will be allowed to be goalkeepers and penalty takers unless the game is still undecided after 3 penalty kicks. Thereafter the goalkeepers and penalty kickers will be switched to the fathers. Unlimited substitutions are allowed during the game But each time a substitution takes place it must comprise a pair of father/child, wherever possible unless injury prevents this. Substitutions can only be made after the referee is notified and only during game stoppages. All balls that have crossed the line of play will be restarted with a roll in. A roll in is defined as a single handed action where the ball travels on the ground once it leaves the hand. The home team stated on the fixture list will kick off the game. Any freekicks will require opposition to be at least 2m away. The distance is a guideline and final discretion is left to the referee. Only freekicks will be awarded for any fouls as there is no pre-determined penalty box in the field of play. Any goal kicks will be restarted by a throw from the goalkeeper. If both teams have similar colours, the away team will be asked to put on bibs. All decisions of the referee are final. At any one time, there should be three fathers and three sons in the field of play. One father is designated as the team goalkeeper while the other 2 fathers will be allowed to play in any other outfield position. All fathers within the field of play are not allowed to score goals. Any deflection off a father which results in a goal will also not be counted and game will restart with a goal kick given to the opposition. In the event a team is unable to field sufficient fathers or sons in the tournament, the Tournament Director will be consulted and will have final say on the make-up of the team. For the purposes of this tournament, substitutions will be by pairs of father and son wherever possible, unless due to injury reasons. Any player given two yellow cards in one match is automatically given a red card and will be suspended for the next match. Any conduct deemed excessively violent will result in a straight red card and possible suspension from the entire tournament. Any team found guilty of deliberately contravening any of the rules stated may face disciplinary action, to be decided by the organising committee. Fathers have a powerful influence on their growing sons. By being better role models and an inspiration to their children, their children will learn to develop respectful relationships and not resort to violence in resolving family conflicts. Goalkeeper – role of the father to protect and safeguard the family. Outfield player – role of the father to support and/or assist the child to score and to shine. Provide chances and opportunities for the child to succeed not only in this game but in real life. Two fathers watching on the side lines – role of a father to cheer, encourage and support the children even if they are struggling or losing. Let the child know that we are there for them and with them. Five fathers in a team – fathering need not be a lonely journey. Fathers should learn that we can come alongside one another to help and encourage each other. SIGN UP and fill in your details to secure a place!